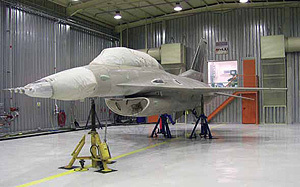 Pauli Systems not only designs, manufactures and installs your Media Blasting & Dry Paint Stripping Facilities, but also trains your Operators to strip aircraft according to strict military technical orders. Pauli Systems understands that the best equipment in the world is not useful without skilled technicians to supervise and operate the system. That is why initial and recurrent training is available world-wide from Pauli Systems. Available only from Pauli Systems, doubles the area stripped per minute, and is the only nozzle in the world that provides a stripping path with equal particle energy across the stripping path. Pauli Systems’ unique media recovery systems don’t plug because they are designed from the ground up for this exact application. Pauli Systems does it right the first time, every time. You can stack a ton of media on top of a Pauli Systems floor recovery section, and there will be no plugging of the pneumatic conveying process–guaranteed. Media reclaim is important because the economics of dry media paint stripping lies in using blast media several times before discarding it. Pauli Systems unmatched equipment ensures that owners of its systems receive maximum benefit from every pound of media purchased. During stripping, process media is contaminated with paint particles from the aircraft, sand and debris from the ramp area, bits of tape and paper, metal flakes and so on. The reclaim section of a dry paint stripping facility must remove these contaminants from usable blast media, returning only clean media to the blast generators supplying the stripping nozzles. - Centrifugal separation via latest generation high-velocity cyclone. This eliminates much of the “fines,” the unusable small, light particles. - Air wash separation with exclusive dual-adjustment (via independent adjustment of air wash velocity and volume) to fine tune the point at which fines are further separated and removed. - Magnetic separator to remove ferrous particles. - Ionization to prevent particles from agglomerating. - Vibratory screen separation, a mechanical separation using gyrating screens to remove both oversize and under size particles from the working mix. - Correctly sized material leaving the vibratory separator now consists of reusable blast media and dense particle contaminants such as sand and metal. - Removing these contaminants is the job of the final stage of separation. Two large Pauli Systems dust collectors provide ventilation in the working environment, ensuring good Operator visibility in the well lit dust-free environment. Good Operator visibility plus the right tools allow maximum production rates and an aircraft stripped to the highest standard. As with ventilation, a brightly illuminated stripping facility with a light grey reflective floor coating and reflective wall covering gives Operators every advantage in performing their stripping duties. Overlooking the stripping bay via a large window in the back wall is the Dry Paint Stripping Facility Control Center. 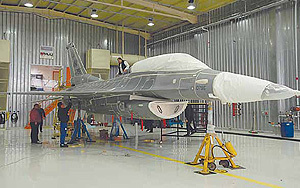 From this position, separated from the equipment room and the stripping bay, supervisory personnel can oversee job progress and adjust stripping process parameters (nozzle air pressure and media mass flow rate) to engineering requirements for any aircraft. This is the “engine” that drives the process. 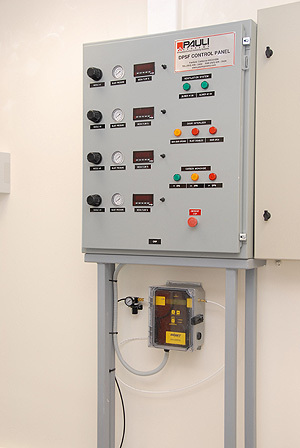 In this area lie the master control panel, floor recovery selector systems, recovered media intermediate storage, media reclaim including DPS, clean media transfer system to clean media hopper, dry stripping blast generators, and delivery hoses from the blast generators back in to the stripping enclosure. A clever cutout in the building eliminates the need for a forced air ventilation system to keep a compressor room cool. The compressed air system is unique in that its sound-proofed enclosure contains a 250 HP air compressor, air cooled intercooler and refrigerant dryer in a single package. 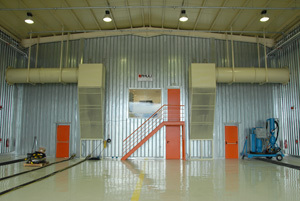 Pauli Systems manufacturers its own dust collectors because standard units can’t do the job as well, or as economically. And these dust collectors are the only units in our industry that allow dust cartridges to be bagged and secured prior to removal, an extra safety benefit for operators.